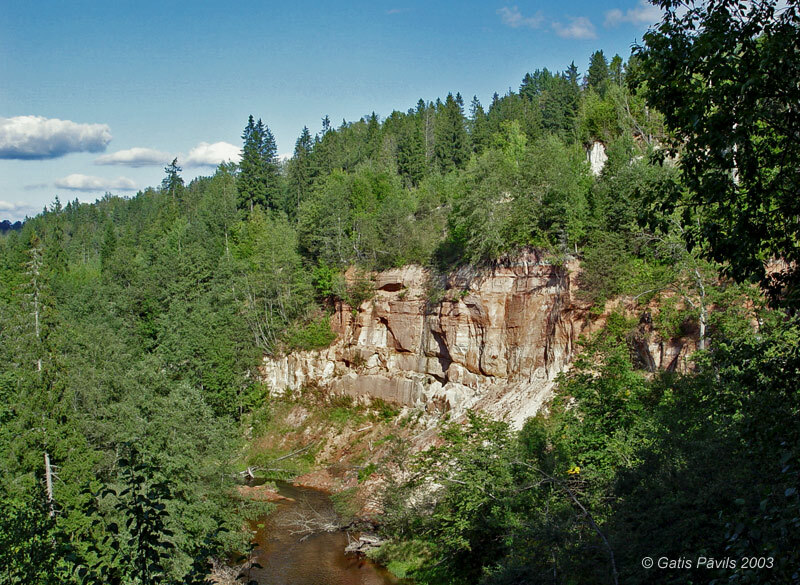 One of the most impressive cliffs in Latvia - Dzilna outcrop. Outcrops are locations where through natural or artificial processes has been exposed bedrock or other sediments which otherwise in most cases are hidden under soil or other sediments. Bedrock in a case of Latvia is - pre-quaternary sediments which have formed at least 1 - 2 million years ago. For most part in Latvia there are exposed Devonian sediments which have formed 350 - 400 million years ago. Interesting steeps or cliffs which are formed of Quaternary sediments are considered to be outcrops as well - such landmarks are, f.e. Ververi precipice, abandoned Libani - Jaunzemji lime pit or beautiful precipices at the sea near Jurkalne or Staldzene. Often outcrops in river valleys or at the sea coast are arranged in rows and it is not that easy to distinguish whether there is one outcrop or many. Author assumes that two separate outcrops are those outcrops which are divided by a distance of at least 50 meters. Outcrops are formed in locations where the speed of erosion exceeds or in geologically recent past significantly exceeded the speed of weathering - mainly denudation. In Latvia outcrops most often are formed along banks and beds of rivers and streams - water and ice here still is forming thousands of larger and smaller outcrops. At the sea coast the number of outcrops is much smaller - but these outcrops are very picturesque and thus - well known. In recent past there were also several outcrops at margins of lakes but nowadays there exists just one almost weathered sandstone cliff at the bank of Burtnieki Lake. Other outcrops near lakes (f.e. Vaidava Lake outcrops) are formed in minor glens at the lake and have not been formed by wawes of lake. Singular natural landmark is the surface of dolostone rocks exposed in Lake Aklais (Jurmala, Kaugur) - but nearly all of it is covered with small dolostone splinters. Outcrops have got both significant landscape value and enormous scientific value. During the decades and centuries there have been elaborated numerous refined methods which let to acquire plenitude of valuable information from outcrops. As the time goes by there is acquired new knowledge and scientists return to seemingly well investigated outcrops and obtain new information again. Latvian cliffs for most part are formed of brittle, crumbly sandstone where it is easy to scratch inscriptions and drawings. As a result most of sandstone cliffs are covered with diverse inscriptions which sometimes are many centuries old and thus are interesting monuments of culture themselves. Unfortunately these valuable monuments too often are covered with newer inscriptions. Still it is possible to find smooth-faced sandstone surfaces without inscriptions - there exist also nearly specular surfaces which are many metres high and wide. Although people who are reading this Website do not need this reminder - still - please do not damage the cliffs! Nowadays it is much easier to confirm existence through comments in different Websites or on paper - inscriptions on cliffs will not help. To the knowledge of superstitious people - leaving your name on cliff is almost like a curse to you - your name for many decades will invoke negative feelings! Below are listed all the outcrops and cliffs described in this website. Each column in this table is sortable by alphabet - just click on the header of the table. The first column - "No." - gives an order of appearance of the landmark in this website.